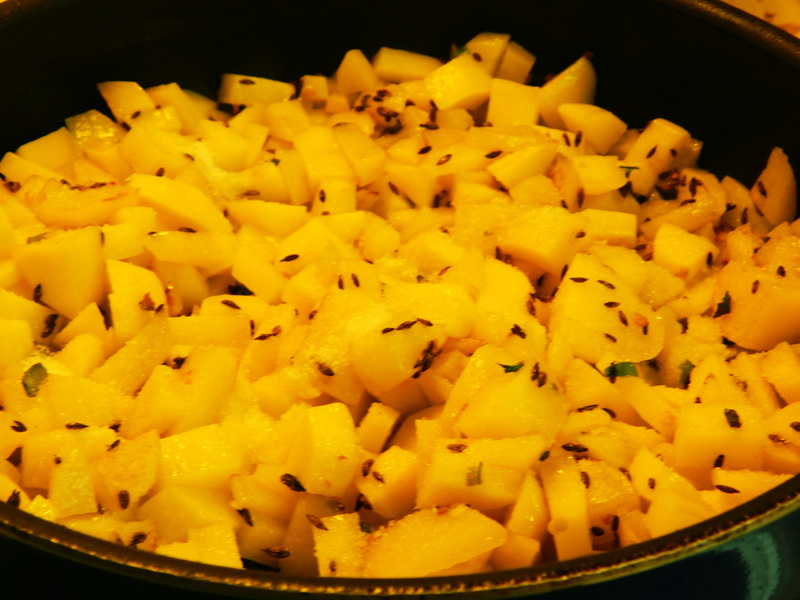 Fried diced potatoes with cumin (or aloo jeera dry) is one of the first Indian recipes my partner taught me to make. 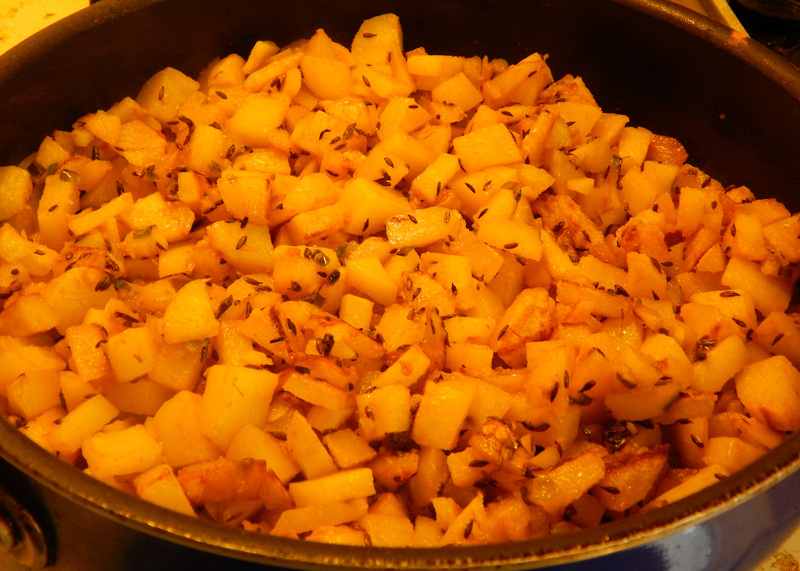 I think of it as Punjabi Hash Browns – a spicy alternative to traditional morning fried potatoes. If you are the kind of person who routinely adds hot sauce or maybe jalapeños to their hash browns, this recipe is a must-try! You can make this as spicy (or non-spicy) as you want. My partner and I use about 5-7 diced green chili peppers, but I’d recommend most people start with 1-3 peppers. Bonus: Leftovers (if you have any!) are marvelous room temperature or even cold. And these make an excellent sandwich rolled into a roti or tortilla. Add in the potatoes and chili peppers. Mix well. 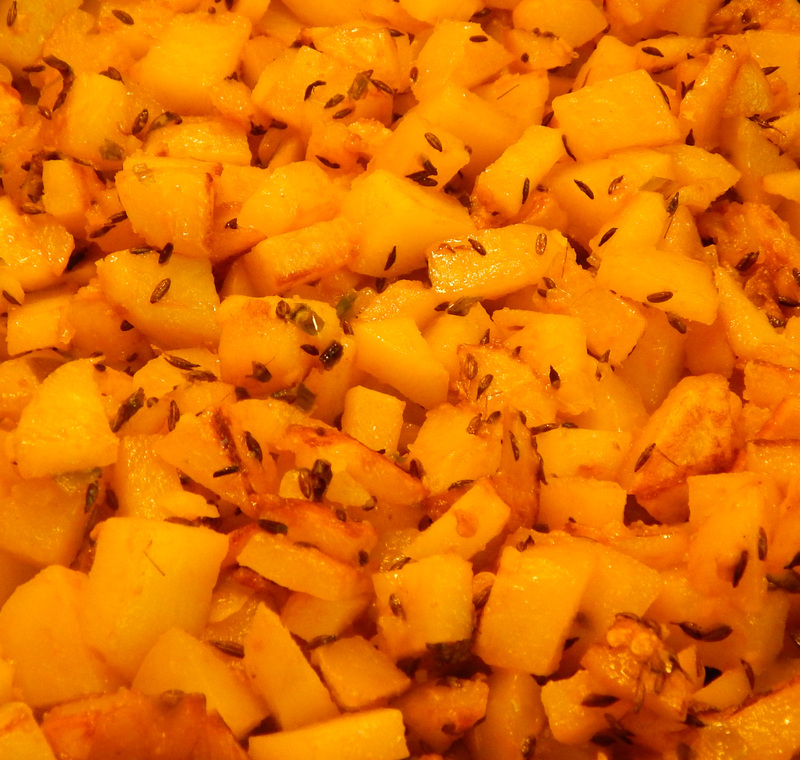 Here, the potatoes are mixed with the chili peppers and cumin. Add the turmeric and salt. Stir gently again until potatoes are evenly yellow. 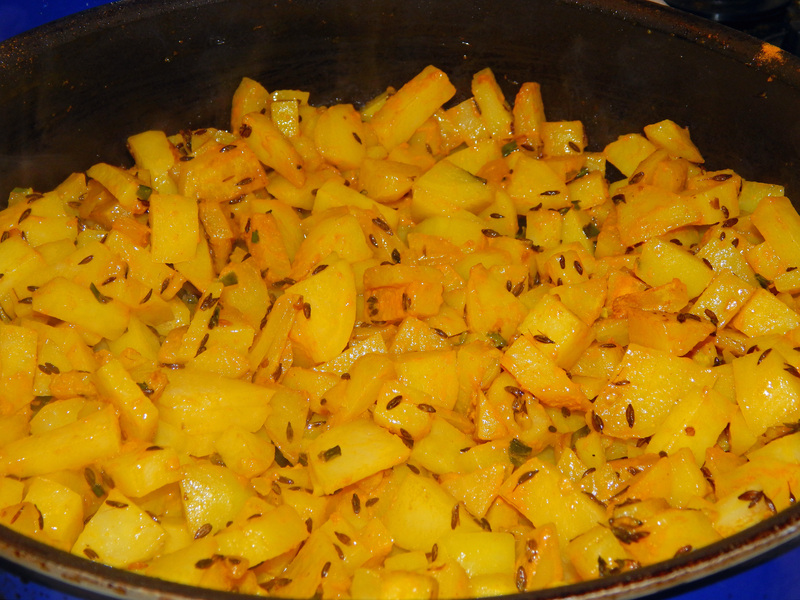 Now the turmeric has been added and the potatoes have been stirred just enough so they are an even yellow color. Let cook approximately 5 minutes, without stirring. Then gently lift and turn the potatoes so the other side can brown and cook another 5 minutes. Depending on how crowded your pan is, and whether you have a single layer of potatoes, you may have to do this 3 times. If your potatoes start to stick or burn, add that 3rd tablespoon of oil. It’s important to be patient and resist the urge to stir – constant stirring will prevent your potatoes from cooking. When your potatoes are done they will be slightly browned on the outer edges and soft inside. A quick taste test will confirm they are done! Thanks, Celeste! It’s definitely a favorite of ours!